Here’s me on my own wedding day! 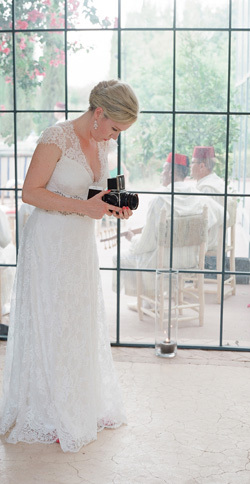 Hello I’m Catherine, and I specialise in destination wedding photography, having traveled all over the globe photographing for the past 14 years. I regularly travel each year between locations across America, Europe, Asia, the Middle East and beyond. I’m lucky enough to photograph assignments across the world, shooting anywhere from Marrakech to Provence, Belize, Beijing, Bora Bora, Seoul, Sydney and beyond. I have the honor of photographing weddings of all shapes and sizes, from intimate gatherings and elopements, to Hollywood celebrity weddings, 400-guest destination weddings, and everything in between. I processed my first negative 20 years ago in my high school darkrooms, graduated from University in 2006 with a degree in Photography and I’ve been a professional photographer ever since. I first started in the world of magazines and newspaper photojournalism, before soon falling in love with weddings. I’ve been honored to have my wedding photography featured by Martha Stewart Weddings, Style Me Pretty, Brides Magazine, Harper’s Bazaar, Vogue Wedding Japan, Destination Weddings & Honeymoons Magazine, Once Wed, Snippet and Ink, Wedding Sparrow, Junebug, Magnolia Rouge, Wedding Magazine, You & Your Wedding Magazine and lots of other beautiful publications. In 2016 I was also honored to be invited as a speaker to incredible Engage and their beautiful conference at Borgo Egnazia, Italy. I live with my husband Chris, who I married in 2017 in my favourite place on earth, Morocco. I have a severe case of wanderlust and am usually plotting the next trip. I’m also a spin class addict, an animal lover, scuba diving instructor and the way to my heart can often involve tiramisu! If you like my style of photography and want to know more, I’d really love to hear from you. The best way is to get in touch with me via the contact page. I will then happily send over some more details, and it would be great to arrange a time to Skype to chat through your wedding plans!